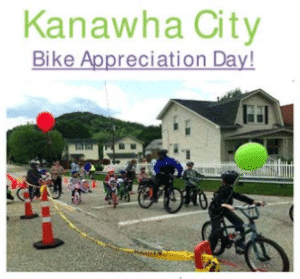 The Kanawha City Community Association is teaming up with the City of Charleston Police Department and West Virginia Connecting Communities for the 2nd Annual Kanawha City Bike Appreciation Day. The event is FREE to the public, and participants will be entered into a raffle for prizes donated by various businesses in Kanawha City. It is May 21, 2017 from noon – 4:00 p.m.
Family Fun Events include bike and trike decorating, face painting, bike tune-ups, and a safety/challenge course. Food and drinks will be available from Charleston food trucks and vendors. All children under the age of 15 will also receive a free bike helmet (while supplies last) thanks to our generous sponsors. Jim Strawn & Company is proud to support this event.